The 14th annual ISPA Conference took place last month on the theme of competition and collaboration. Coming at an exciting and dynamic time for the sector, the event featured keynotes, presentations and panel discussions from across Government, industry and regulators. The lively discussions throughout the day raised a number of important themes, including the need for ambitious but achievable rollout and coverage targets, removing barriers to deployment, the importance of a level playing field from a regulatory perspetive, the need to stimulate the demand side of the market and the importance of a customer-centric approach. A full summary of discussions with video coverage will be made available shortly. We would particularly like to thank our hosts and sponsors for making the event possible: Bird&Bird, Openreach, Arista and Xantaro. ISPA will be co-hosting the annual Parliament & Internet Conference in the Houses of Parliament on 20th November. Kindly hosted by Nigel Huddleston MP, this one day event will see senior stakeholders debating the most pressing policy issues facing the Internet. Alongside keynote speeches delivered by Rt Hon Jeremy Wright QC MP, Secretary of State for Digital, Culture, Media & Sport and Rt Hon Liam Byrne MP, Shadow Digital Minister; the agenda includes panels which will address ways of improving confidence and trust in the Internet and will cover a range of themes, including: cyber security, content regulation, and harnessing new technologies. ISPA members get priority tickets – please contact admin@ispa.org.uk for the link and password to access your free ticket. 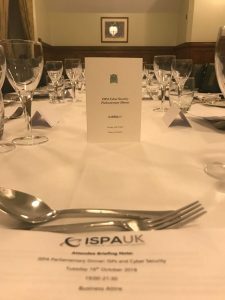 This month, a number of Parliamentarians and ISPA members from across the internet value chain came together over dinner in the House of Commons to launch ISPA’s Cyber Security Survey and discuss issues affecting the industry. The evening was chaired by Conservative MP Matt Warman, who stimulated the wide-ranging debate, building cross-party consensus with labour counterparts, including Shadow Minister for Cabinet Office, Jo Platt MP, all agreeing on the severity of the issues at hand. Key takeaways from the discussion included the need to boost education and develop a strong skills base in the UK, further input from Government to set a framework of good standards for cyber security, and the need for collaboration to tackle the full scale of the threat. ISPA’s Broadband subgroup responded to the Ofcom consultation on end-of-contract and out-of-contract notifications, calling for greater consideration of the complexity of the supply chain in the industry. Further to this, ISPA responded to the Competition and Markets Authority inquiry into the Super Complaint from Citizens’ advice regarding ‘loyalty penalties’. ISPA once again outlined the need for a more coherent approach to such consumer issues, and for the CMA to take account of existing work being done in this area. Both of these responses highlight the ways in which our members already strive to protect vulnerable customers particularly, and called for a greater appreciation of the healthy competition and choice delivered by the retail market. A survey carried out by the Internet Services Providers’ Association (ISPA) has found that Government must streamline its approach to cyber security to achieve its ambition of making the UK the safest place to be online. In response to the survey, ISPA members voiced concerns over the risk of creating unnecessary complexity and duplication of reporting and responsibilities across regulatory bodies that Government must address. Find our 10 key findings here. ISPA Awards are returning to London for its 21st year! The awards will take place on 11th July 2019 in the beautiful art deco surroundings of Sheraton Grand Park Lane. The entries will open in December and we offer many opportunities to promote your company to wide audiences. If you would like to associate your company with any of our 13 awards categories or sponsor our welcoming drinks reception, please contact us on awards@ispa.org.uk or call 020 3397 3304 now. This month we called on the government to streamline its approach to cyber security which was reported by uSwitch, Info Security, ISPReview and Telecompaper. Our members Krystal Hosting mentioned winning at ISPA Awards in Response Source. ISPA is partnering with INCA Conference, taking place on 5th and 6th November in London. This year they will celebrate the growth of the sector, focus on new developments and opportunities and continuing government support through funding programmes and highlight the appetite of investors to support the altnets. For all partner events and discount codes please visit our website.